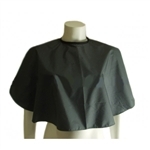 100% Nylon Short Makeup Cape front with rubber laminated on back. It is perfect for beauty salon, VELCRO or SNAP Closure. Wide range of Capes is tailor made to give rich look at reasonable price.